Cook eggs, pancakes, burgers, or sauté vegetables with these best skillets, including cast-iron, nonstick, and copper options. "Use it to stir-fry veggies, sear meat, and make delicious breakfast food." “A frying pan that’s both beautiful and functional." This classic stainless steel skillet is made from 18/10 stainless steel with a mirror finish. 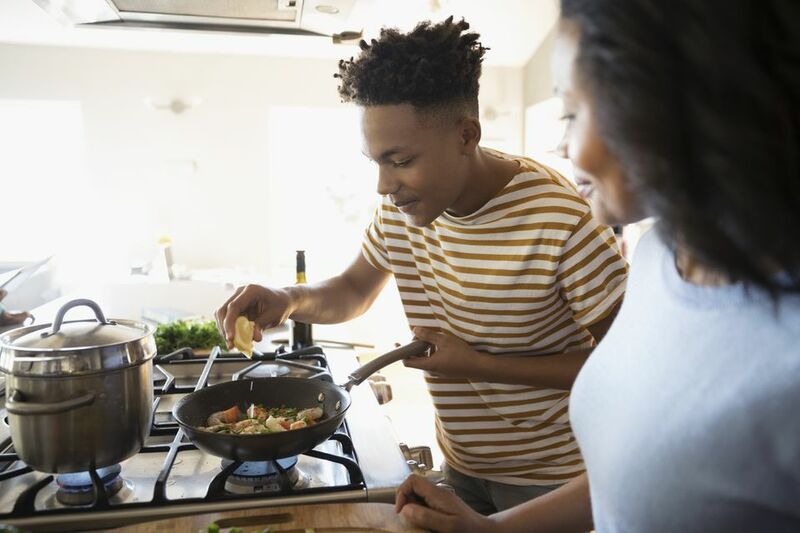 It won’t stain, discolor, or react with foods, and you never need to worry about using metal utensils or scraping the pan with a metal spatula to get under foods. The cast aluminum handles are riveted on for security, and they’re designed to stay cool during cooking while providing a sure grip. The aluminum-encapsulated base heats fast and distributes the heat evenly, so you won’t have hot spots. The pan is oven safe to 550 degrees, so you can use it on the stovetop, in the oven, and even under the broiler. It’s also freezer-safe. The rim of the pan is designed so you can pour liquids from the pan with fewer drips and spills, and the helper handle makes it easier to move the pan or pour, even when the pan is very full. The pan is dishwasher safe for easy cleaning. This pre-seasoned 10 1/4-inch cast iron skillet is ready to cook with as soon as it arrives, and it gets better with every use. While the pan doesn’t have a nonstick coating, a well-seasoned cast iron pan rivals non-stick and can even be used for cooking eggs that would cling to a stainless steel pan. 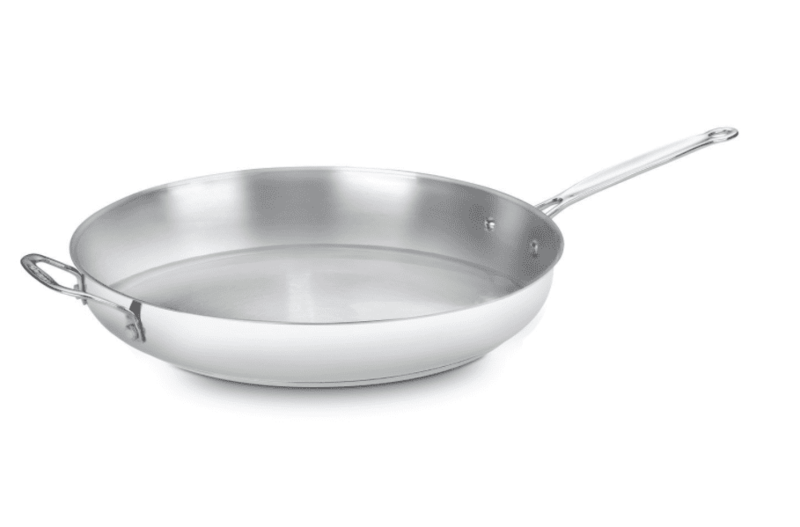 Even better, this pan is affordable, very durable, and made in the USA. It’s a pan that can be passed down as an heirloom to younger generations. Cast iron is known for heat retention and even heating, so it keeps its heat during cooking and stays warm for longer than other metal types. It’s oven and broiler safe and can be used for baking, including making skillet cornbread. It can also be used as a roasting pan for small roasts or chickens. This pan has a helper handle that makes it easier to move, but the handles tend to get hot during cooking so a pot holder or handle cover is recommended. This should be washed by hand and dried right away. Occasional re-seasoning might be required, depending on what you cook in it. This can be used on any stovetop, including induction, as well as on a grill or campfire. This set includes both an 8-inch and a 10-inch skillet, so you’ll always have one handy. They’re made from hard-anodized aluminum for great heat distribution and easy food release. The surface is metal-utensil safe, so you can use any utensils you own. The base of the pan has a layer of aluminum encapsulated with copper, then another layer of aluminum, followed by a stainless steel cap. This gives it superior heat distribution and excellent heat control. Because of the stainless steel, it can be used on induction cooktops. The handles are riveted on for security, but the rivets are flush on the inside for easy cleaning. The pans are oven safe to 500 degrees. They do not come with lids. Want to take a look at some other options? See our guide to the best nonstick cookware sets. For the sturdiest electric skillet money can buy, the Presto 16-inch Electric Foldaway Skillet is a top-rated product that boasts a variety of cutting-edge-yet-dependable features. Crafted from heavy cast aluminum that’s nonstick on both the exterior and interior, this skillet is equally great for preparing big family meals as it is for making quick, one-pot stovetop dishes. You can use it to stir-fry veggies, sear meat, make delicious breakfast food, and more. The Presto skillet measures 19" x 12" x 8" and has a built-in spout, that also doubles as a spoon and spatula holder, so you can easily pour liquids from it. In addition, the lid is made of tempered glass and, thanks to the skillet’s stay-cool handles, you don’t need oven mitts when handling it. Need multiple skillets? This three-pack includes an 8-inch, a 10-inch, and an 11-inch skillet at an affordable price, so you’ll always have the one you need. Or keep two at home, and send an extra to college with your kid. Since they’re so inexpensive, they’re ideal for a vacation home, but they’re sturdy enough for everyday home cooking, too. These skillets are made from heavy gauge aluminum for fast and even heating, and the nonstick surface means your omelet will let go easily when you make breakfast. The handles stay cool while cooking and the pans are oven safe to 350 degrees. That’s not as high as some higher-priced pans, but warm enough to finish a steak in the oven or keep your hash browns warm. For easy cleaning, you can wash these in the dishwasher. These do not include lids but they're available in several different colors to match your kitchen or add a pop of color. This Le Creuset pan combines the advantages of cast iron while being easy to maintain. It has a black enamel interior that never needs seasoning and a brightly colored exterior, available in multiple colors to match your kitchen or add a pop of color. The interior resists staining and dulling, and it’s very durable. This pan has a long handle as well as a large loop-shaped helper handle that makes it safer and easier to move the pan, even when it’s full. Because it’s made of cast iron, it retains heat well and it stays hot for longer than stainless or aluminum pans. Like any cast iron pan, this is heavy, so you might not be using it for flipping vegetables or pasta, and it will be even heavier when it’s full. Unlike standard cast iron pans, this is dishwasher safe for very easy cleaning. If you’re looking for cookware that’s both beautiful and functional, this 11.8-inch frying pan might be just what you need. The pan is made from copper on the exterior, for super-quick response to heat changes as well as even heating across the whole surface of the pan. It has a thin layer (just 10 percent of the pan) of 18/10 stainless steel on the interior that’s non-staining, non-reactive, and easy to clean. The handles are cast stainless steel and they stay cool during cooking. There is a similar pan with brass handles that might be more attractive, but those handles tend to get hot during cooking. While copper is beautiful, it darkens with use and age. Some cooks enjoy the look of that patina, but if you prefer a bright and shiny pan, it will require cleaning and polishing to keep it that way. This is not suitable for induction cooktops as is, but the manufacturer says it works well with a disc to transfer heat. The pan is made in France. Check out our other reviews of the best copper cookware available on the market today.